Hyperpigmentation is commonly described as sun damage, sun spots, dark spots or age spots. The more sun damage there is, the more discoloration the skin has and makes one look older. For women, dark spots require extra effort with extra make-up in the morning before leaving the house. It also definitively affects self-confidence because you may think that everyone is looking at you. It also significantly makes the skin look older and hence why dark spots or hyperpigmentation spots are also called the “age spots”. Also, let’s not forget the damaging effects excessive sun exposure has on the collagen and elasticity of the skin, leading to early wrinkle and fine line appearance, early skin sagging and definitely premature aging . Asian women are known around the world for their porcelain doll like skin, but it is also well known how much effort it takes to keep that skin so “porcelain looking”. Well, not anymore. Let’s just say it used to take a lot of effort and it involved daily bleaching creams which would cause a lot of skin irritation and a big risk with laser technology, because all lasers were designed for Caucasian skin and not Asian. 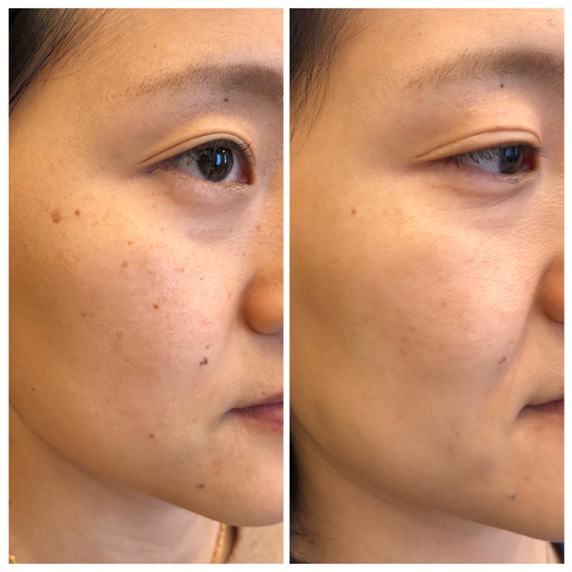 Removing discoloration is not an easy task to do, but the advances in current aesthetic medicine and laser technology are making it possible without any downtime and minimal to no side effects for practically any skin tone. No one has the time for peels or lasers or creams which give a lot of downtime. It will be performed and offered in practices which are very old fashioned and not forward thinking and not catching up with the technology. What is so special about PicoSure Focus laser? It’s the world’s first Pico Technology laser which doesn’t use heat making it safe and extremely effective for Asian skin to erase sun damage and sun spots. It is FDA approved for all skin types, including Asian. Is PicoSure Focus similar or same as Fraxel laser? Fraxel is from one company and PicoSure is from another company. They are both Fractional type of lasers. Fractional laser means that the energy used is divided in almost honeycomb pattern in order to deliver the results. Fraxel is old school and PicoSure is new school with higher safety margin and higher patient satisfaction and with almost no to very little downtime. Is PicoSure laser a resurfacing laser? Yes it is. It is the Rolls Royce of skin resurfacing to be exact. It stimulates skin collagen and elastin production. It rejuvenates the skin, removes sun damaged and leads to a brighter, smoother, younger looking skin with no downtime. It also the best laser for pore size reduction. Will PicoSure make my skin peel? PicoSure Focus technology does not result in skin peeling. PicoSure Focus skin rejuvenation treatments is extremely safe for Asian skin when performed by a PicoSure laser expert like Dr.Avaliani. Why choose Dr.Avaliani for your PicoSure Focus Skin Rejuvenation? Dr. Avaliani is a leading expert of PicoSure technology on the North East in her state of the art laser center. Dr.Avaliani is a Picosure trainer and has developed numerous protocols for treatment of various skin conditions with PicoSure like acne scars, melasma, brown spots, actinic ketarosis and even keratosis pilaris and much more. 80% of Dr.Avaliani’s patients are of Asian ethnicity and she has become an expert in treating and managing Asian skin . To find out what PicoSure by Dr.Avaliani can do for you, please call 212-673-8888 to see PicoSure Expert for your personalized consultation.